The SCP-STA series refers to the SCP products whose output type is external thread type. Its rated voltage is 2.7V, capacity range from 650F to 5000F. The series ultracapacitor combine the features of the normal capacitor in rapid charging and discharging ability and the energy storage ability of battery, so they bridge the gap between electrolytic capacitors and rechargeable batteries. 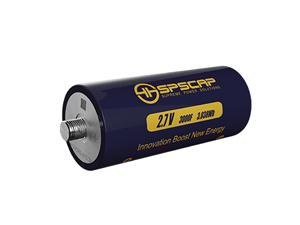 The storage process of SCP 3000 Farad ultracapacitor as well as the rest of SCP-STA series does not need chemical reaction, and the process is reversible, therefore the super capacitor can tolerate repeated charge and discharge for hundreds of thousands of times, and will not cause environmental pollution. In addition, it has excellent power density,as 10-100 times of the current, so it is suitable for high power output in a short period of time. With fast charging speed and simple pattern, it can realize large current charging and complete the charging process in a few seconds to a few minutes,so it is a real quick charge. SCP-STA series are widely used in transportation and electric power plant and grid.